Other “tells” were that the book was full of Americanisms; and that the confused Flew himself later couldn’t recognize the arguments attributed to him. Yet despite the hoax being exposed in 2007, almost upon arrival, the film version of Case for Christ goes out of its way to name-drop Flew, and Christians are still repeating the bogus story. In fact, more Christians seem to know “the world’s most notorious atheist” than atheists ever did. 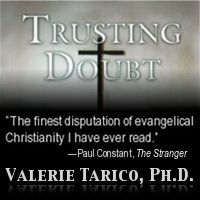 Gallery | This entry was posted in Christianity in the Public Square, Musings & Rants: Christianity and tagged Christian apologetics, Christian hypocrisy, Evangelicalism, Lee Strobel. Bookmark the permalink. Great piece. Thank you! I remember being so impressed with Strobel back in my evangelical days. So glad I’m out of that delusion. Love your work! I’m shocked another famous Christian is a liar and con artist for mammon. Keep up the good work Valerie! I guess I am not surprised, but I am disgusted at the behavior of people who tell us constantly that we cannot be moral without their god. Apparently they cannot with it. I was given a copy of The Case for Christ and read about six pages before realizing that it was a bogus effort, a sham. If one knows anything about the Bible, it is easy to see where Mr. Strobel drifted away from the truth. Back in my Bible college days, the chancellor of the college said in a sermon: I’m not preaching now, I’m telling the truth. 😀 40+ years later, I totally understand his statement (even though he was being funny). Preachers, by design, massage and rewrite the stories they tell. They don’t let facts get in the way of telling a good story. Stories of supernatural conversions sound doubtful or unbelievable, yet congregants holler AMEN! And church members do the same during testimony times. I really did lead a bad life before The Lord accepted me. And if i was given the choice, I wish i had never done the things i did. Instead i wish i was raised in a home where there was Jesus Christ at the heart of that home. That way there would be much less sin on my behalf. And it wouldn’t be as easy for me to be a wicked man. Christian walk seems tough at times, but easy route leads to nothing good. Maybe y’all should have told that man how blessed he is? I’ve seen just the opposite. People raised in a christian home, yet bad. Also people raised in a secular home, and a pillar of the community. So, there never was a guarantee of being good because christ was preached, but being raised to be moral with a sense of responsibility and having empathy. Without those, it doesn’t matter how you were raised. The “christian walk” is tough because all failures are your, all successes are god’s. It erodes your self-image. But it can also become a form of justification. “I committed this evil, but jesus forgives me.” Robert Deer, the Planned Parenthood, shooter justified exactly this way, the thing is he’s not wrong. An acquaintance pushed this book on me in her attempts to help me find my way, and though I couldn’t stomach it, let alone finish it, I kept the book for an appropriate amount of time before returning it. Now I chuckle at how shame and guilt worked their wiggly religious fingers into my psyche around the whole thing. I’ve had the thought to push this article on said acquaintance, but I won’t. She will come to the truth on her own eventually. I can’t help but feeling a tad vindicated. Thank you. I am so very glad I am not Christian. Sadly, I saw too many examples of Christian leaders stretching the truth to the breaking point for “the cause of Christ.” Too many preacher stories told from the pulpit that I knew weren’t true, for example. It’s one of the things that prompted me to look more objectively for truth. The closing point of the article is right on: why would a supreme being need any extra help to make himself and his will evident? Shading, bending or augmenting the truth is your admission that the truth doesn’t support your views. Have seen his name thrown around but knew nothing of the guy. This was a great read. Thanks. Often thought, if i didn’t have any morals I’d pen an Atheist-to-Believer book and sell it to evangelicals. I know ALL the arguments and what lights their fire, and what they *want* to hear. Pushing those buttopns would be the easiest thing imaginable…. and lucrative, as you’ve pointed out. Excellent read. I appreciate your work so much Valerie. I can prove Christianity is false just using the New Testament itself. Here is one of my essays. I’ve never had any of my essay printed, as they were during my own studies which led me and my wife out of the Christian faith. Hosea 11:1) Why did they have to flee to Egypt ? Did they go to Egypt? According to Luke 2: 39, they went to Nazareth and were not in the dangerous area of Bethlehem, where it is alleged that Herod had the children slain. This creates another problem Herod died four years prior to when the church originally stated that Jesus was born. Perhaps Matthew’s placing them in Egypt to fulfill scripture was too quick for Joseph and Mary to remember, for Luke 2: 22, has them in Jerusalem for forty days after the birth to fulfill Leviticus 12:1-8, and then in Luke 2:39, they return to Nazareth. They also seemed to forget how the shepherds, made known the saying which had been told to them about this child, Luke 2: 17. Mary and Joseph even forgot, how they marveled ten months after the angelic visitations, that is, one month after the event surrounding Jesus birth. At that time they were already surprised when Simeon and Anna, the daughter of Phanvel, spoke of Jesus future while he was yet still an infant. Luke 2:25-38. If these events are historical, why is it that later, during Jesus active period, no one, not even his family, seem to know of his marvelous origins, Matt.13: 54-55, If a conception took place would not Mary have some idea just as to who Jesus was? Would not she reveal this information to her family? Yet we find that Jesus relatives, who came to seize him, Mark 3:21,31, are not told by Mary his mother, who comes and joins them, that contrary to what they think, Jesus is not crazy. The gospel of John states “For neither did his brothers believe in him” John 7: 5, Did Mary not inform the rest of her children of Jesus divine origins. It is hard to understand that Mary would not inform them that Jesus was the “messiah” so that they might believe in him and thereby enjoy salvation, and what of Mary’s own reaction towards Jesus. In the few appearances that Mary herself makes in the gospels, during the lifetime of Jesus, there is no indication that she showed any understanding that her son Jesus, was the “son of God.” by means of a unique conception. Mark 3:31-35, John 2:3-4. She, Mary revealed no such understanding to his followers. Jesus earlier followers said that Jesus became the “Son of God” through the resurrection and they never mentioned a unique conception. Paul declared Jesus to be “Son of God” with power, by the resurrection from the dead. Romans 1: 4, see also Acts 13: 33, Where Psalm 2: 7 is applied to the resurrection. The doctrine of a unique conception seems to have no effect upon Christian teaching prior to its mention in the last part of the first century. On the basis of New Testament records it is doubtful that Jesus family, or the early believers, and most of all, even Mary herself did not know about the unique conception she is alleged to have undergone.” Did you not know that I must be concerned with the affairs of my Father?” Strange as it may seem, Mary and Joseph did not know it. They did not know it because they had never heard of their son’s “miraculous conception”. It appears that the unique miraculous conception came into circulation long after the deaths of the people in this story. @Jim Lee: Are your essays available on the web? Please, give us a link to them, if that’s the case. The essay here above is just super! I really like your skillful reasoning. Valerie, a theoretical physicist says your non-believer position is ‘irrational’. The 2019 Templeton prize winner, Marcelo Gleiser, flatly supports the god is real claim. See the latest issue of the Scientific American magazine. I contend that his claim ofscience based proof of God is so.much hokum. Hmm. Did you read that article. They of course pulled his most controversial statement for the title, but from the context it appeared that he was talking about only positive atheism, meaning an affirmative stance that there is no god, as opposed to simply a lack of belief in the absence of evidence. Also, if I remember correctly, he was pretty clear that all he thinks the scientific method allows for is some prime mover–not the humanoid gods of religions. Just a quick scan of the article. Thanks, Valerie. I will revisit it. Do you know anything about the Templeton Foundation? It’s a Christian research org which Sean Carroll noted: “the entire purpose of the Templeton Foundation is to blur the line between straightforward science and explicitly religious activity, making it seem like the two enterprises are part of one big undertaking.” The Templeton Prize for Progress in Religion was renamed in 2001 the Templeton Prize for Progress Toward Research or Discoveries about Spiritual Realities. I’ll have to go back and double check it too. I also find it amusing that Fitzgerald is chiding Strobel for offering fluff, misinformation and noting his works in need of fact checking given the level to which these traits afflict his own handling of these topics in his book Nailed. Thank you for the correction. He is indeed ordained as a Baptist minister, and is indeed not a historian. His credentials appear more substantial than implied by Fitzgerald’s description, but hardly more objective. I received my PhD from Aberdeen. Like all ancient universities in the UK (Oxford, Cambridge, St Andrews etc) it was set up by church leaders. One famous incident from the University was taken to be at the forefront of signaling the closing of a predominant Christian Britain https://academic.oup.com/ehr/article/CXXVII/525/345/395412 The Divinity department is a leading center for secular Biblical research in the world. Well known secular New Testament scholars such as Professor Steve Mason have recently taught there. It was also one of the first universities to teach courses on secularism (run by Dr Anja Finger), and gave Richard Dawkins an honorary doctorate. It was the first University in the UK to list Carriers’ books on Jesus mythicism in its curriculum. The University is routinely ranked as one of the most prestigious places to study New Testament history in, and recently was honored in this regard by the NTS. People coming to read your article are told by Fitzgerald that Strobel is interviewing preachers, who have no expertise in New Testament history, and he provides the example of a person who has a PhD in the topic and who publishes in peer-reviewed New Testament journals! That is misleading. Utterly and objectively. But then this is Fitzgerald, the guy who routinely massacres classical history in his polemical books. He has a pretty long and substantiated record of playing loose with the facts in order to score an ideological point (e.g. his use and appeal to Seneca, Philo, Aramaic etc is just as troublesome). The phrase people in glass houses shouldn’t throw bricks rather springs to mind. Unless you are suggesting all theology departments in secular universities the Anglophone world are not objective, e.g. Oxford, Cambridge, Princeton, Yale (etc) your comments above are entirely without merit. Thank you for the Ms. Knight link. That was fascinating history that I knew nothing about. As to your question above, please see “Rational Human’s” comment below about Hinduism. Although this grossly oversimplifies, a theologian studies the history within a story, typically within some assumption of the veracity of the story. A historian analyzes the context in which it was written including prior literary/cultural/philosophical influences that shaped the author and story. To my mind it’s the difference between studying the intricate landscape of Middle Earth, the characters and their alliances and the author’s meaning–vs studying Tolkien, WWII, other contemporary and prior influences or the writing and publishing timeline and process. That said, I claim no expertise in either. I myself am more interested in the psychology and sociology of religion, rather than either of these. You said, “(when he has a PhD in the *very topic* that is being discussed- the historical Jesus- from a secular university and has peer-reviewed publications on it).” I’ve tried hard to find Blomberg’s exact degree and/or his dissertation topic and can’t seem to find either. All of the sites I’ve seen simply say he has a Ph.D. in New Testament, which could mean either history or theology. I’m not arguing here–just looking for accurate information since I’m not actually interested in hosting information that is inaccurate. Might you be able to point to one of these? Mistaken? He made no claims about Aberdeen, and his statements about Blomberg’s credentials were that he is a Baptist preacher (which implies a literalist theological commitment), and that he is not a historian. Although they don’t reflect the theological credentials that Blomberg has, both appear to be true. Valerie. He is critiquing Strobel for talking to preachers instead of scholars and experts in the field. Fitzgerald is referring to the New Testament, Bloomberg does not have a theology degree, he has a PhD in * New Testament history* from a secular university (check the ethos database, his PhD, it was on the historicity of the gospels) and from one of the most respected universities in the world for NewTestanent scholarship. Aside From Blomberg’s doctorate in the very subject Strobel is asking him about, Bloomberg publishes widely in secular, prestigious, peer-reviewed journals again *in the very field * Fitzgerald is saying Stobel is not talking to experts but “preachers”. Fitzgerald is by any objective standard (again) misleading people and your readers. He is hardly giving a fair or accurate description. I myself might have called him an ordained Baptist seminary professor and preacher. “We believe the Scriptures of the Old and New Testaments are the inspired Word of God, inerrant in the original writings, complete as the revelation of God’s will for salvation, and the supreme and final authority in all matters to which they speak.” This kind of a priori faith commitment is fundamentally incompatible with the work of a historian. Perhaps also to the point, or more to the point, is that Blomberg had concerns about how Strobel represented his views. Might I ask why your emotional concerns center on Fitzgerald misleading thousands than on Strobel misleading millions? We have a transparent mistake, in an article that is revelling in chastising Christians for producing material wherein ” fact-checking” has to be undertaken for the whole picture to emerge, and that which displays righteous indignation throughout about their “sleight of hand” techniques. Do you see the irony? I have only a passing awareness of Strobel’s work, but I assure you I have no qualms in calling out apologists for either side. Judging from looking at the table of contents of Strobel’s book it is, barring one exception, a who’s-who of late 1990’s evangelical thinkers who considered the historical Jesus and it is transparently obvious that Strobel has self-selected them to reach a predetermined conclusion of the accuracy of the Biblical Jesus. I have no doubt at all that Strobel is misleading his readers. I have no hesitation about pointing out both sides’ (the Christian and atheist) compulsion to fall for amateur, biased “scholarship”. For years I ran a first year tutorial to history students where I had them go through Fitzgerald’s terrible book Nailed chapter two, and Josh McDowell’s equally misinformed “Evidence that Demands a Verdict” chapter 10, in a class that was devoted on how to properly use secondary literature and spot fraudulent scholarship. The key question for those racing to Blombergs defense – would you accept that a Hindu priest, educated in Hindu theology and history, employed as a teacher of Hinduism, is an “historian”? Look at it as an outsider. If we are not sure that the New Testament represents actual history, then even the title “NT historian” makes a mockery of real historians. But what’s a little bit of lingual prestidigitation amongst apologists? I would not accept a random Hindu clergy member’s views of the historicity of Hinduism as being worthy of mention in a book on their creeds’ historicity. I would however be of the opinion that someone who has a doctorate in Hindu history from one of the leading secular institutions that studies Hindu history, and who publishes in the leading academic outlets on the history of Hinduism to have a legitimate voice, and not childishly try to claim “ah they are just a Hindu clergy member”.